The shocking case earlier this week of the Croydon devil dog - shot dead by armed officers after unsportingly failing to succumb to a robust tasering - provoked a flurry of reader emails demanding El Reg provide the now traditional CCTV evidence of the incident. As you can see, the malevolent mutt managed to administer canine jaw-based justice to two coppers before popping off to the great dangerous dog pound in the sky. The mutt's 13-year-old owner, meanwhile, has decided to accept a cuffing in lieu of hot lead, and has ditched his traditional Saarf London arsenal of automatic pistol, cutlass and antique sword. 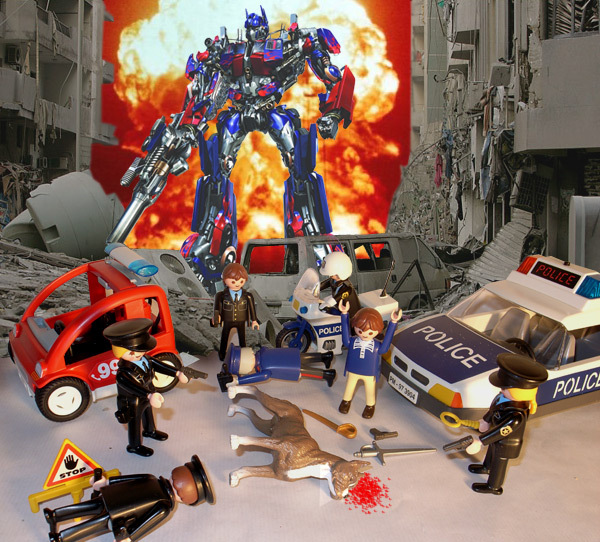 In the excitement, however, the Met's finest have once again failed to notice Optimus Prime, who's just come from Lunar House where immigration officials revoked his indefinite leave to remain in the UK following the complete destruction of Heathrow's flagship Terminal Five.